Red Rock Canyon State Park is located in Southern California in the Mojave Desert. The canyon is composed of sandstone cliffs thousand’s of feet high, resting on ancient limestone and topped with volcanic rock. 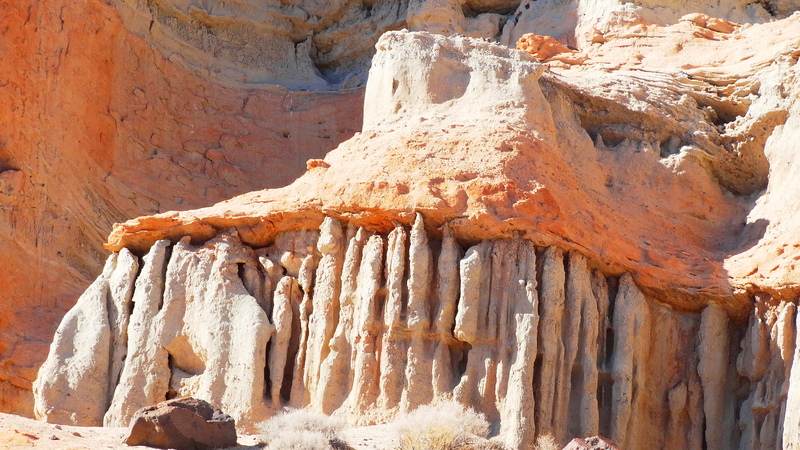 Check out these amazing formations! They reminded me of The Valley of the Kings in Egypt. (Click to enlarge). 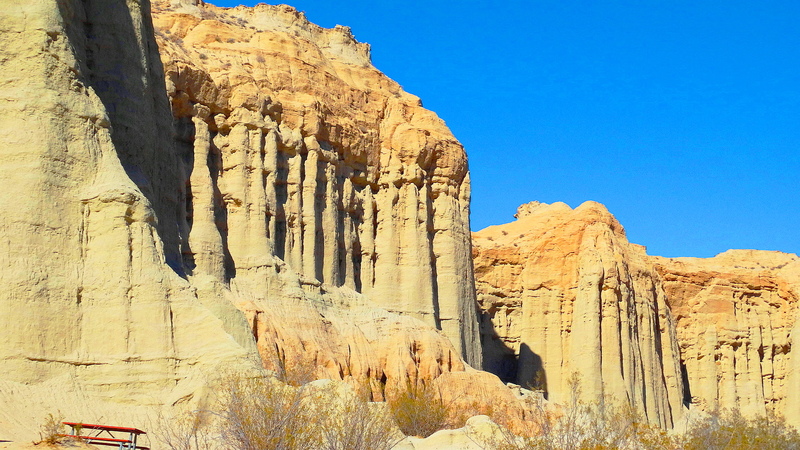 The formations are approximately 14 million years old. The park is full of fossilized dinosaurs including elephants, extinct rhinos, three-toed horses, saber-tooth tigers and much more. It contains the richest concentrations of fossilized flora and fauna in Western North America. It is still being excavated by the Museum of Natural History. Check out the people climbing in one area of the park. I included them so you could how massive these structures are! The canyon sits on top of what was once an ancient inland lake. 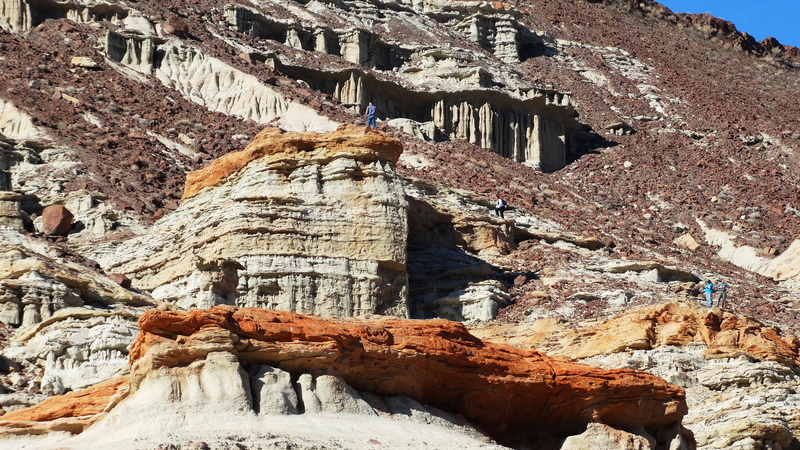 It is composed of sedimentary and igneous rock layers. The vibrant red colors in the rock are from leeching iron oxide. 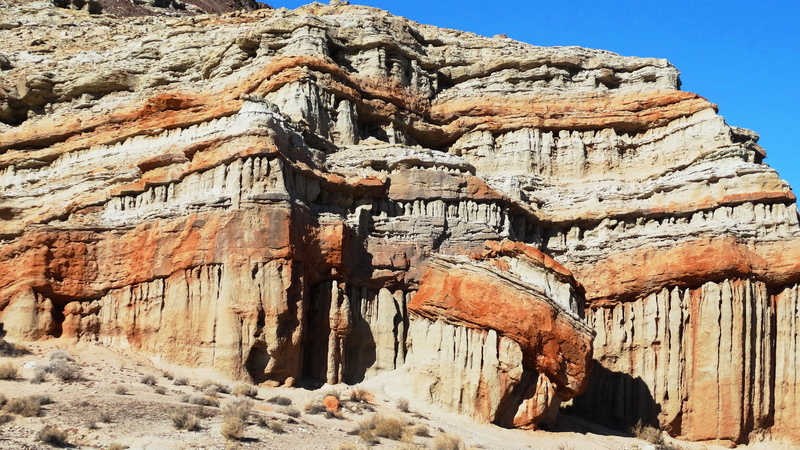 Red Rock Canyon was lifted by three seismic faults which pushed ancient rock to the surface. 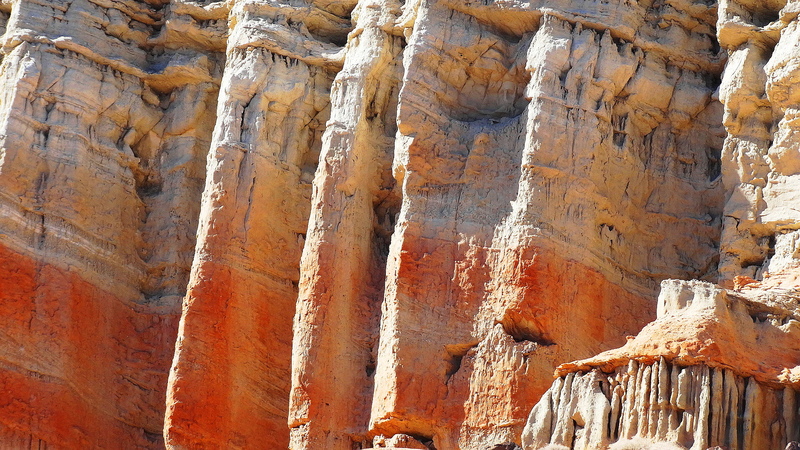 Wind, rain and sand erosion carved the beautiful structures in the sandstone. This area was used as a trade route by Native Americans for thousands of years and is home to delicate desert flora and fauna. Winter is a great time to visit! It is empty and not too hot. Cheers to you from the pristine and empty Red Rock Canyon! ← Happy New Year to You From Trees Older Than The New Year! Thanks for taking us to this magical place. Isn’t it amazing how the elements gave shape to such amazing rock structures that look like palaces left behind by some extinct civilization. Another site for my bucket list…. Oh you expressed that so beautifully…..”palaces left by ancient civilizations” is a wonderful description! The rock structures are fascinating. 🙂 🙂 Thank you! Thank you! I have nominated you for the One Lovely Blog award because I think you are awesome and deserve to be recognized. Thank you for your words and your thoughts. Oh you are so thoughtful and I so appreciate it! Mil grazi my friend! Es mu amable! Muchas gracias y tiene un buen dia! Su recetas son maraviloso tan bien! I love the title right-away! I love everything ancient, probably because I have always been “categorized” as ancient by my friends. L-O-L!!! The plant in the last photo looks so cute. I wonder if the “white hairs” are flowers of needle-like leaves! Yes the ancient places are spiritual and exude peacefulness. I love being around them. There were so many mythical creatures here long ago. So many dinosaurs including huge “bone crunching” dogs that I had never hear of. I know this will get your imagination going Hari! 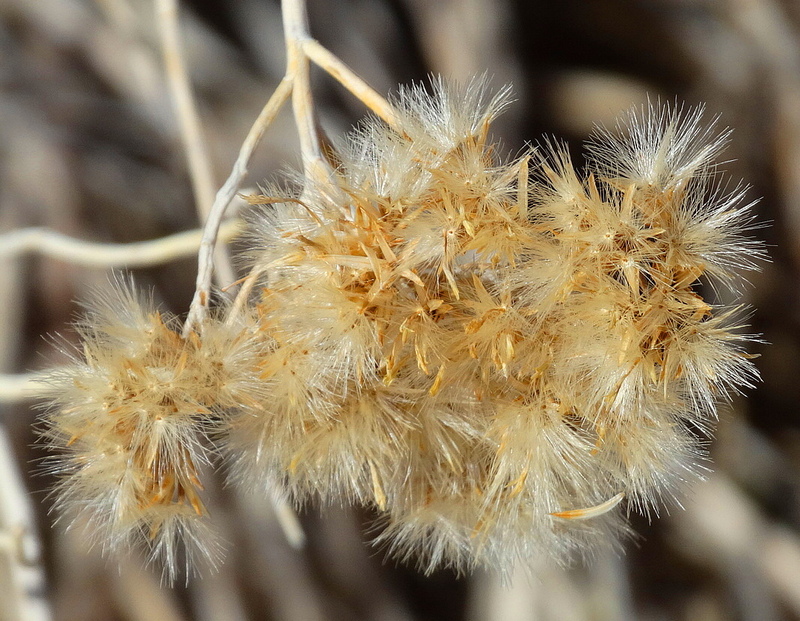 And yes the flower was a prickler…….the kind that sticks to your sock and itches! Absolutely stunning! And those columns do look manmade don’t they? Good comparison between them and The Valley of the Kings. Cath. What an astonishing place. Nice photos. Alrighty now…if I weren’t jealous before I definitely am now – beautiful!!! Isn’t it though and quite a surprise to me as well!! Beautiful photography, Cindy. I often share your blog with Tom as he’s passionate about fine photography. Awww, how nice! Tell him I said Haw Do! Beautiful shots capturing the grandeur of such unusual sights, Cindy! It looks like the ruins of an ancient city or the set of a fantasy movie. Great idea including the people for perspective of the size. 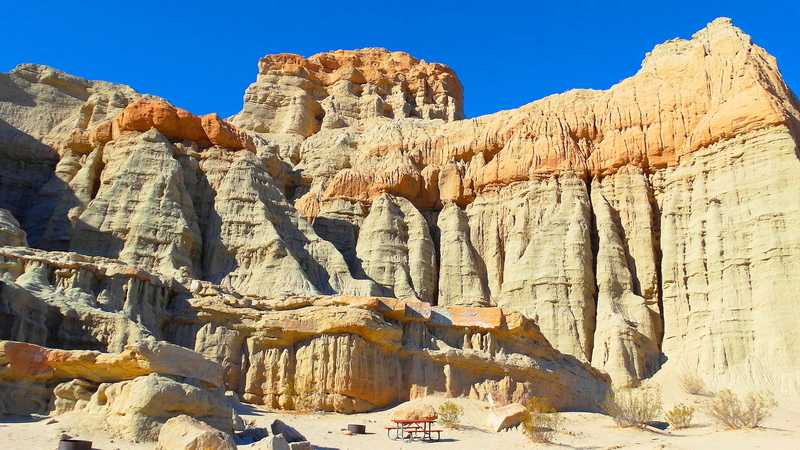 Red Rock Canyon state park is absolutely incredible and the rock formations are amazing ! Beautiful photos you’ve took and shows us that this gorgeous park is more than worthy to visit it 🙂 ! Thanks for your amazing photos of this magnificant terrain. I did not see the man till I read your text,then i could see the the scale. It is strange how something can be close by and one never know about it. I was born in Socal. Jim was not. He is the one who found this place. Go figure….. Stunning captures! Thank you for all the interesting information on this amazing place! Stunning Cindy! I grew up not far from there. 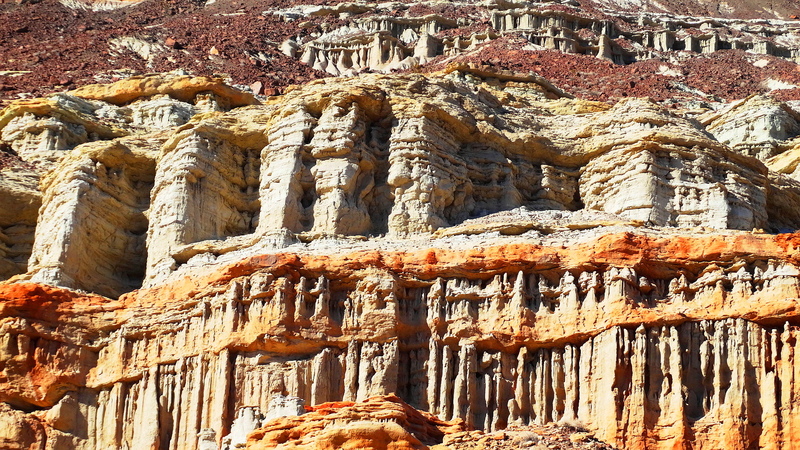 Have you been to Red Rock National Park just outside Las Vegas? It is very different but equally beautiful. Yes I have been there and saw the wild horses. So gorgeous..isn’t your son a floor manager in LV? Beautiful! Yes, Josh is the one who took me to Red Rock. He also his own financial planning practice that he is planning to go full-time with in the near future. Smart cookie like his mom! Cheers to you from the sunny Carib! Wow, incredible place! It is a must see! Thank you! Ms Cindy thank you for posting these pictures, they are beautiful. Yes, I do too, both Bryce & Zion!